Nairobi - "Green City in the Sun"
What’s the deal about Nairobi? The city doesn’t have the best reputation, and most tourists use the city only as a fly-in hub to get to the safari parks or the beach resorts. But I think you’re missing something if you don’t spend a day or two in the city. It has a lot going for itself and if you stick to some simple safety rules, nothing unpleasant is likely to happen to you. This is the main entry on the city – all the other city pages are linked from here. Kenya's capital is a big cosmopolitan city where you’ll meet all kinds of interesting people, with a thriving cultural scene, lots of quality hotels (though seldom cheap), restaurants serving food from all over the world, sophisticated cafés, great shops, and killer night clubs. And… it’s the only city worldwide with a full wildlife resort just outside the city centre. You can be right between the lions and giraffes with a public city bus! More in my mini travel guide. Economically and politically, the city is important too. It’s the center of East African business life, and many international organizations are based here. Because of this, health facilities and public infrastructure is among of the best in Africa. The city has some 3 million inhabitants. 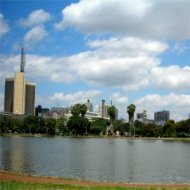 Nairobi's weather is very pleasant – sunny throughout the year but, because it’s 1600 metres above sea level, not as steaming hot as the coast region. With all the trees and green parks, this is where the city’s nickname ‘Green City in the Sun’ is coming from. The place is an all-year round destination. Nairobi National Park is located just outside the city. It’s a full wildlife resort of 117 square kilometers (45 sq. 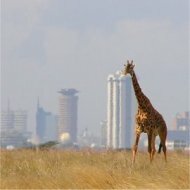 miles) where you can spot animals like giraffes, lions and buffaloes in the wild against the backdrop of skyscrapers. The Karen Blixen Museum, located in the former house of the famous author of “Out of Africa”, shows what early settler life was like. At the Masai Market and other city markets, you can buy beautiful wooden sculptures, beadwork, clothing, shield and spears etc. directly from the craftsmen who made them. The National Museum shows Kenya’s past, including prehistoric items from it’s ‘Cradle of Humanity’ past. Many of these sights are part of day tours that you can book through your hotel or tour operator. Here’s more about the city’s tourist destinations. Nairobi has a lot of hotels and they are seldom fully booked. Most top-end places offer the same level of quality and service that would expect anywhere. But most city hotels aren’t cheap compared to the overall price level of Kenya. It's only a the bottom end of the market that hotel prices are really cheap, but the quality is correspondingly low. Kenyans are terrific meat eaters, and at Carnivore Restaurant large (and we mean large) quantities of meat, including game, are barbecued over half-open fires. It’s a touristy place, but still a must. Tamarind Restaurant has a reputation for great seafood, fresh from Kenya’s coast. Perhaps the most famous bar in the city is the Thorn Tree Café at the Stanley Hotel. The colonial-style Norfolk Hotel has a street terrace which is great for people watching over a cold beer. My personal favorite is Simmers. Their open-air terrace in the heart of the centre is great for anything between late breakfast and evening beers. For the city’s somewhat notorious night life, head for Pavement - which has an international restaurant and a busy bar and disco, often with live music - or the New Florida night club, nicknamed the Madhouse – which also has a restaurants and pretty crazy dance and other acts. Be aware that many women there, and elsewhere the city's night life, are working girls looking to hook a European or North American. Except when you’re coming in from one of Kenya’s neighboring countries, the only practical way to get into Kenya is by air. Here’s information about all air connections to Kenya and tips to get the cheapest tickets. All intercontinental flights come in through Jomo Kenyatta International Airport in Nairobi. The city’s second airport, Wilson, has flights to tourist destinations in Kenya and neighboring countries only. Public buses and matatus (private minibuses that follow the same routes as the buses) are the cheapest ways to get around. A matatu will take you anywhere for 50 Kenyan shilling (half a US dollar!) They can be crowded, and matatus drive recklessly. Taxis are the other main option, and plenty available. A taxi ride within the city centre should cost around 300 shillings, to or from the suburbs or the airport around 1200 shillings. You can’t drink tap water in the city, but you can buy bottled water (without gas) everywhere. Regarding food safety, be careful with cheap restaurants and street snacks. Meat, fresh products and anything that isn’t cooked is to be avoided when you have doubts about hygiene. There are many banks with ATM’s from where you can take Kenyan shillings, and sometimes also Euros and American dollars, with most regular bank cards. Credit cards are accepted at hotels, shops etc. that serve tourists. Bargaining in shops, with street vendors, safari tours and taxis is a must. If not, you’ll pay the double or even triple price. In restaurants and hotels however, bargaining is not done. Here’s more about the climate and about Kenya’s time zone.